These days, free time comes in short supply and when I do find an extra moment during the day I either make a mad dash for the shower or run to the basement to throw yet another load of dirty burp cloths and baby clothes into the washing machine. So when it comes to meals, time is of the essence and the easier the preparation, the better. We’ve found a few favorite dinners that are easy to put together and make enough to throw leftovers into the freezer for a future meal. Our freezer, which was previously virtually unused, is now stocked full with Tupperware icicles just waiting to be unthawed. One of our favorite meals to make is soup. 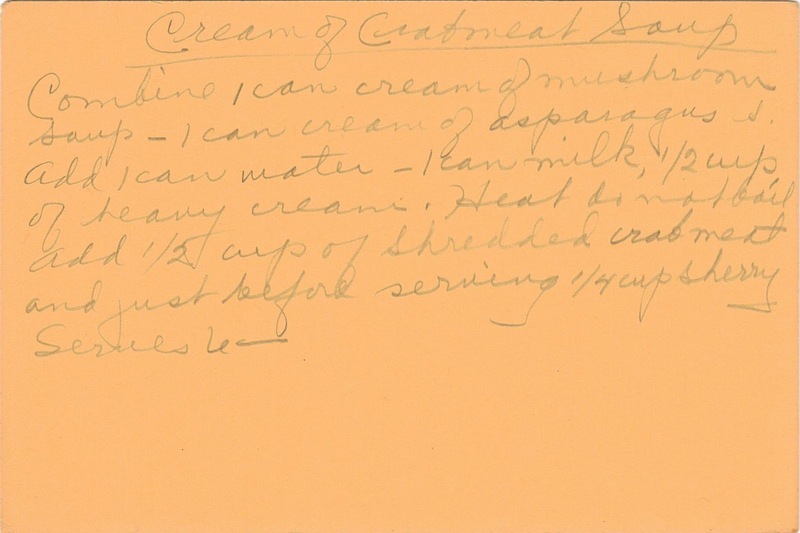 Before Lucy was born, we dug into the Found Recipe Box for some new recipes to try and pulled out the card for Cream of Crabmeat Soup. At that time, I didn’t appreciate how easy this recipe is to prepare. I took my time opening cans and pouring them into the soup pot, scraping each one to make sure I got every last drop. I carefully cut up the crabmeat, daydreaming the whole time about what life would be like with a baby and how I couldn’t wait to share the Found Recipe Box with my little girl. When it came time to eat, Ryan and I both sat down at the same time, savored each spoonful of soup and lingered around the dinner table after we finished so that we could see the end of our TV show before doing dishes. As we poured the rest of the soup into a container to freeze, I never imagined how different our lives would be the next time we tasted that rich, creamy broth. Now, unless we can time meal preparation perfectly to catch a moment when Lucy is sleeping, Ryan and I take shifts to eat – and by “eat” I mean devour our food so quickly we barely taste it so that the next person can dive into their meal which has already started cooling off. I am no longer reading recipe cards, but instead am following the heating instructions for already prepared meals. And any daydreams I have are usually the result of dozing off on the couch with Murphy while Ryan and Lucy spend quality time together discussing her future of following in her father’s footsteps and becoming a soccer player – a sport which she practiced frequently while in the womb. But, life moves quickly and I know that these sleep-deprived days will be over before I know it. Soon, Lucy will be crawling around collecting dog hair on the floor while I heat up those frozen meals. Then she’ll be walking, soon after running, and chasing Murphy around the yard. So I’ve taken the lesson Cream of Crabmeat Soup taught me and I’m savoring every moment I have with Lucy. When she falls asleep in my arms, I just stare at her instead of placing her in bed to sleep like all the books recommend. I absorb her warmth, memorize her face and place soft kisses on her forehead, careful not to disturb her peaceful slumber. Sometimes I wish I could press pause, freezing those moments just like I did the leftover soup, and linger there just a little longer before thawing it out and moving into the future. Because you can always throw a cold meal in the microwave to reheat it, but if I let those precious moments I have with Lucy go, I can never get them back. And nothing is more delicious than spending time with my little soccer player/future Found Recipe Box baker. She's trying to think of something sweeter than her...shortbread tarts, chocolate cake? Nope, not even those! This is such a great blog! 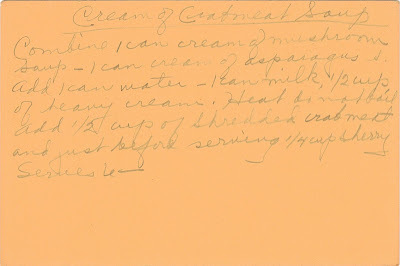 I recently 'found' my mother's recipe box and we're blogging about it together at http://www.rocknrecipes-rocknquilts.blogspot.com Hope you'll stop by for Grandma Block's Sour Cream Cake with Brown Sugar Frosting recipe!